perhaps they were sitting over an oval table, having a whiskey, discussing the publishing plans they had for the next year.... whom they would sign on this springtime excursion to the continent. fortunately their work was not really in competition so they were able to be friends. the fourteen years difference in age between them dissolved. William Morris's stature as both a leader of the Arts and Crafts movement and the socialist camp made him an appealing figure to forward-thinking Americans of various stripes. In addition, Morris's experiments in self-publishing encouraged the creation of small presses in America which published books, pamphlets, and magazines to spread the gospel of liberated work. 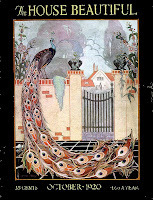 Enthusiasts like Gustav Stickley, Leonard Abbott, Herbert S. Stone, and Elbert Hubbard printed and/or edited numerous publications, many of them hand-sewn and embellished, which quoted and invoked Morris for enterprises that tended to wander further and further from Morris's original beliefs. Their discourse was largely dependent on small magazines which combined literary offerings and crafts features with coverage of radical issues and quasi-radical "freethinking." one of these new-publishers, as noted by morris, was herbert stuart stone. in 1894, with his friend hannibal ingalls kimball, both having just graduated from harvard, decided to put out what amounts to a promo piece: it was called the chap-book. enter ernest batchelder and the many others recently inflamed by the passion of new ways to work, new ways to see. 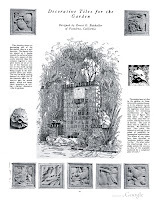 the american home, like those in europe, was being remade, and as the chap-book failed due to total ignorance about business practices, stone had an idea for another magazine, one for which he knew there was a burgeouning audience. in 1896, in chicago, the house beautiful was born. dismissing the typical victorian house as a 'hideous aggregation' of 'dismal dreariness' and 'tawdry finery,' the magazine discovered a more enduring beauty in simplicity. ** across a few states, over in new york, another magazine with a similar philosophy was beginning, but rather than it being the successful business stone now hoped for, this one was part of a religion. 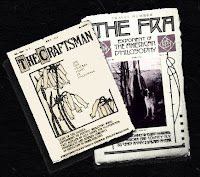 where the house beautiful was slick, the fra, the roycrofters' publication under elbert hubbard, looked hand-done. where the house beautiful might talk a lot about the carpeting, the fra might talk about the soul. still the two both wrote of the home, both shared the soul of a movement. or did until that night, as they sat at that table discussing the craftsmen in europe they'd hoped to meet, and as their ship was torpedoed by the german soldiers. hubbard and stone both went down with the ship. C'est un joli petit voyage dans le monde de l'édition avant-gardiste que vous nous avez concocté là ! Sorry that I have been gone so long and I have missed your elegant and erudite blog. I found myself swept up into pressing issues of economy and politics. Dismaying topics to say the least and I have decided to retreat. My little chrysanthemum plants are two and three feet tall and surely I will have a few spectacular blooms. I am planning to name one of them for you and will post its photo. Lately, I have taken to playing them a little Debussy to edge them on. Artwise, I have been enjoying a little discussion on Raoul Dufey and love the sense of space and light in his work. -Ah the mystery of blue. Another beautiful and interesting post, Lotus! princess! so happy to see you back--i think of you often. and i'm honored by your comments.